Scattered protests were reported in at least a dozen Syrian towns and cities following midday prayers Friday, despite a heavy security presence and arrests of activists in many locations. Large protests were also reported in Yemen, while the situation was reported to be tense in the Libyan capital, amid pockets of opposition to embattled leader Moammar Gadhafi. Thousands of Syrians turned out to protest against the government after defying a violent crackdown which has resulted in the arrest of thousands of people and hundreds of deaths. Opposition sources report that security forces fired on protesters in the flashpoint city of Homs, killing several people. Witnesses reported that tanks were stationed inside the Bab al Amr neighborhood, which was shelled by the army several days ago. Arab satellite channels showed a thick crowd of hundreds of people chanting anti-government slogans in the flashpoint city of Daraa, despite nearly three weeks of a bitter and brutal occupation by security forces and government militiamen. Syrian government TV, however, accused Arab satellite channels of broadcasting “false and fabricated videos,” and of disseminating “bankrupt propaganda.” It claimed that the situation was “completely normal” across the country. In the flashpoint coastal city of Banias, witnesses described a heavy army presence, and said that streets were mostly deserted. Syria’s Information Minister, however, claimed that army tanks had been withdrawn from the city. In Yemen, tens of thousands of protesters turned out in the capital’s Tahrir Square to demand the resignation of President Ali Abdallah Saleh. 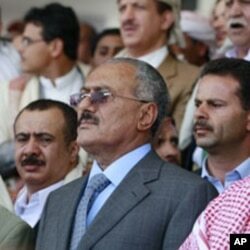 Supporters of Saleh gathered for a rival demonstration in Sanaa’s Square 70 to hear the president speak. He says that the situation is deteriorating and that [the opposition] should stop playing with fire, or the people and the military will put a stop to it. He accused protesters of trying to destroy government buildings and demanded that those that want to take power come to the ballotbox. Elsewhere, in Libya al Arabiya TV reported scattered acts of resistance against embattled leader Moammar Gadhafi in the capital Tripoli. Witnesses also say they heard gunshots overnight in several neighborhoods. NATO planes bombed a number of targets in the capital overnight.